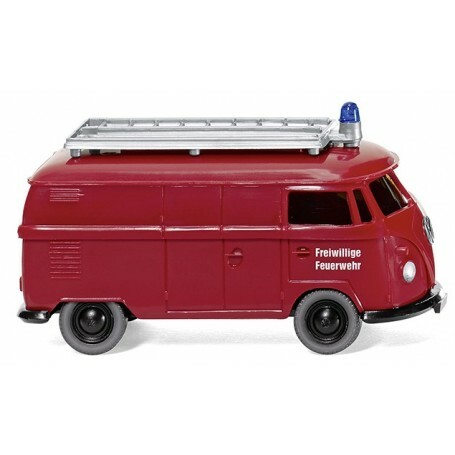 Fire brigade - VW T1 van, 1963. Upper and lower chassis parts red. Chassis with black bumpers, wheel rims also black. Ladder structure with signal light base silver, inserted transparent blue warning light. Imprinted black VW logo on front. Door design with white 'Freiwillige Feuerwehr' lettering on side. Front indicators signal orange, tail lights red. Front headlamps hand-painted silver.